Objective The aim of this study is to synthesise evidence for the experiences and perceptions of incivility during clinical education of nursing students. Design We used a meta-aggregation approach to conduct a systematic review of qualitative studies. Data sources Published and unpublished papers from 1990 until 13 January 2018 were searched using electronic databases, including CINAHL, PubMed (MEDLINE), ProQuest Central, ProQuest Education Journals, ProQuest XML-Dissertations and Theses, Web of Science, Embase, EBSCO Discovery Service and PsycINFO. The search for unpublished studies included the Open Grey collection, conference proceedings and the Deep Blue Library. Eligibility criteria We included qualitative studies that focused on nursing students' perceptions and experiences of incivility from faculty during their clinical education. Data extraction and synthesis Two reviewers independently appraised the methodological quality and extracted relevant data from each included study. Meta-aggregation was used to synthesise the data. Results A total of 3397 studies was returned from the search strategies. Eighteen studies fulfilled the inclusion criteria and were included in the meta-synthesis. Six synthesised findings were identified, covering features of incivility, manifestations of incivility, contributing factors, impacts on students, coping strategies and suggestions. Conclusions The results showed experiences of incivility during clinical education. However, the confidence was low for all synthesised findings. We suggest that nursing students should try to cope positively with incivility. Nurse managers and clinical preceptors should be aware of the prevalence and impact of incivility and implement policies and strategies to reduce incivility towards nursing students. Hospitals and universities should have an immediate response person or system to help nursing students confronting incivility and create an open communication environment. We used the Joanna Briggs Institute meta-aggregation method to synthesise qualitative data, which minimised re-interpretation of original studies. We performed a comprehensive search strategy to find all relevant studies in nine academic databases and four grey literature databases. Both published articles and theses were included to provide unbiased results. We only included studies in English. All included studies were conducted in USA, European countries and Australia. Cultural variation may have accounted for individual responses to incivility. Incivility is defined as a rude and deviant act characterised by low-intensity discourteous behaviour with or without intent to harm, offend and humiliate the target.1 2 For decades, nurse-to-student incivility has been prevalent in clinical settings. The unfortunate idiom ‘nurses eat their young’ has been used for more than 30 years.3 Previous studies showed that nursing students had experiences of being bullied, harassed and unfairly blamed by clinical faculty. The results from a study conducted by Clark and Springer revealed that over 70% of 356 respondents believed that incivility in nursing education was a moderate or serious problem and had increased over the last 5 years.4 A survey conducted in Oman showed over 40% of the respondents experienced different forms of incivility, including being disrespectful, being unprepared for class and cancelling scheduled activities without warning.5 The literature suggests that several key factors contribute to incivility. The aim of this study is to synthesise evidence based on the experiences and perceptions of nursing students regarding incivility in clinical education. Specifically, the review addressed the following research questions: (1) What behaviour in the clinical environment did the student consider uncivil? (2) To what extent did these behaviours affect them? (3) What strategies did they use to cope with incivility? The inclusion criteria included the following: (1) The participants were current nursing students undergoing clinical education or had already completed their clinical education. (2) The phenomena of interest focused on the perceptions and experiences of incivility from faculty during clinical education. (3) Context: faculty incivility must have occurred in clinical settings or during clinical education. (4) Qualitative studies including but not limited to ethnographies, phenomenologies, narrative studies, grounded theory and case studies; additionally, mixed-method studies with a narrative description of faculty or student voices describing the phenomena under study were also considered. (5) Studies published in English. We included both published and unpublished papers. A three-step search approach was conducted in this study. First, we searched MEDLINE (via PubMed) to analyse the text words and the index terms that could be used in the comprehensive search. Second, a comprehensive search was conducted across all included databases using keywords and index terms. The databases included CINAHL, PubMed (MEDLINE), ProQuest Central, ProQuest Education Journals, ProQuest XML-Dissertations and Theses, Web of Science, Embase, EBSCO Discovery Service and PsycINFO. The search for unpublished studies included the Open Grey collection, conference proceedings and the Deep Blue Library. Relevant papers published from 1990 until 13 January 2018 were evaluated. The search terms included nurs* AND (student* OR graduate*) AND (incivilit* OR bully* OR workplace violence OR uncivil OR aggression* OR harass*) AND (hospital* OR clinic* OR workplace*). The search strategy for PubMed (MEDLINE) is available in online supplementary appendix II. In the third step, additional studies were searched manually by screening the references of related studies. The search results were imported into Endnote V.X8 (Clarivate Analytics, Philadelphia, Pennsylvania, USA), which was used to manage the literature. We used the Joanna Briggs Institute (JBI) Critical Appraisal Checklist for Qualitative Research to assess the methodological quality of the included studies.18 This 10-item JBI critical appraisal tool is designed to assess research quality in different domains, including research methodology and conceptual depth of reporting. Two reviewers appraised the methodological quality of each included study independently (ZZ and WX). Disagreements were resolved through discussion. The JBI standardised form was used to extract qualitative data. The data extraction form included the following domains: study (year), country, design (data collection method), phenomenon of interest, recruitment and participants, and main findings including relevant illustrative quotations. Relevant data were extracted independently by two reviewers (ZZ and WX). Disagreements were resolved through discussion. The JBI meta-aggregation method was used to synthesise the data. Meta-aggregation is one approach that can be used to synthesise qualitative evidence based on the primary author’s findings and is a useful method for generating recommendations for action.18 This approach focuses on integration of findings from processed data rather than raw data collected from participants. The overall goal of meta-aggregation is to produce synthesised findings that are highly relevant for practitioners, patients and policy makers.18 Data extraction, comparison and synthesis were conducted using the Joanna Briggs Institute System for the Unified Management, Assessment and Review of Information (JBI-SUMARI).19 The procedures involved four steps. (1) Thorough repeated reading of the paper, with verbatim statements and accompanying quotations extracted from each study by the primary reviewer (WX). Only findings identified as highly correlated with our phenomenon of interest were extracted from each study. To ensure rigour, the second reviewer (ZZ) checked all extractions. (2) Two reviewers (ZZ and WX) independently assigned the credibility level for each research finding. All disagreements were resolved through discussion. If more than one quotation was included for the same finding, we assigned the highest level of credibility (unequivocal >credible > unsupported). (3) Findings rated as unequivocal or credible were aggregated into categories based on similar meanings. Findings rated as unsupported were eliminated from the subsequent analysis. The categories were determined by the primary reviewer (WX) and affirmed by the second reviewer (ZZ). Disagreements were resolved by consensus. (4) Categories with commonality were further integrated into the synthesised findings by the primary reviewers. The synthesised findings and recommendations were examined by all coauthors involved in nursing education. The synthesised findings were assessed using the JBI approach for rating confidence of synthesised qualitative findings (ConQual) to determine the confidence level.20 The confidence level was rated high, moderate, low or very low based on the dependability and credibility of the included study. No patients or members of the public were involved in the design of this systematic review. Flow chart of the search strategy and results. Table 1 summarises the quality assessment of the 18 selected studies. All 18 studies had similar phenomena of interest, methodologies and data analysis methods. Only one study reported the potential beliefs and values of the authors that might have influenced the findings.22 Three studies reported the authors’ roles in the study that might have potentially influenced the interpretation of the findings.22 31 34 One study did not provide representations of the participants and their voices.15 Two studies did not report the ethical approval process.15 28 The disagreement rate between the two reviewers was 6.6%. Eighty findings were retrieved from 18 articles. Six synthesised findings were identified. Of these findings, 70 were rated as unequivocal and 10 as credible. An overview of these synthesised findings is summarised in table 3. Different types of incivility can be experienced by nursing students. Some types are noticeable, whereas others can be more subtle and are difficult to prove. Most nursing students are unprepared for incivility from multiple perpetrators. Faculty incivility in the clinical education context towards nursing students manifests as a lack of professionalism in the workplace, being disrespectful and unfair towards nursing students, and making nursing students feel unwanted and ignored in the workplace. Worse, some manifestations, including physical abuse and sexual harassment, violate the law. This synthesised finding originated from 28 findings and was grouped into five categories. The acts of incivility in clinical education can be categorised into lack of professionalism, being disrespectful, feeling unwanted and ignored, inequality, physical abuse, and sexual harassment. Faculty incivility in the clinical education context has a huge physical and emotional impact on nursing students and influences the professional formation process. Facing faculty incivility in the clinical context, nursing students can develop either negative or positive coping strategies to accept the harsh realities of life or fight incivility. Students’ individual factors, staff factors and clinical culture factors place nursing students at risk for incivility. These factors work individually or collectively. Both the university and hospital can consistently respond to faculty incivility in clinical education towards nursing students. Building an anti-incivility environment requires that the university and hospital work together. This synthesised finding originated from eight findings and was grouped into two categories. The last synthesised finding describes suggestions from nursing students for universities and hospitals. The suggestions for universities can be categorised into four sectors;24 33 educating and preparing student responses to incivility; having an immediate response person or system; having faculty to follow-up and continue monitoring; and having peer support and other opportunities. Suggestions to hospitals can be categorised into four factors;22 30 33 qualifying preceptors and performing continuous evaluations; having perceived authority as instructors; clarifying the roles of students; and establishing a positive professional role model. The ConQual Scores and the summary of the synthesised findings are provided in table 4. The confidence was low for six synthesised findings, where were downgraded one level due to dependability limitation issues. A mix of unequivocal and credible findings was another reason to downgrade the credibility of all of the included studies. Our systematic review and meta-synthesis provided a comprehensive picture of nursing students’ experiences with faculty incivility in the available literature. Based on the exhaustive search strategies, 18 studies were included. Six synthesised findings were identified, covering features of incivility, manifestations of incivility, contributing factors, impacts on students, coping strategies and suggestions. The meta-synthesis revealed that in addition to disrespect, feelings of being unwanted and ignored, inequality, and lack of professionalism were identified as important displays of workplace incivility. This finding added to our knowledge that nursing students regarded instructors who acted without professionalism as uncivil, which was different from faculty-to-faculty incivility.38 In the clinical education setting, nursing students still expect preceptors to be role models and demonstrate positive and constructive manners.39 40 Even working with medical teams, most nursing students are subjected to a structured academic setting during the transition from a student to a nurse.41 42 Therefore, nursing student orientation uses the same evaluation standard to measure the behaviours of both clinical preceptors and academic faculty. This result indicates that a qualification assessment and training are essential for clinical nurse preceptors. Different from previous discoveries, our study showed that many nursing students adopted positive strategies to cope with incivility. Previous studies noted that students tended to use avoidant strategies when facing uncivil behaviours.15 26 The use of negative coping strategies may contribute to increased emotional burdens, being the target of incivility and holding a grudge against the victimiser.37 Nevertheless, in recent years, a series of antibullying campaigns have popped up everywhere in response to the situation of uncivil behaviours in schools. Ending bullying has become a trend among students.45 Some studies have argued students should come to a resolution between themselves and the person exhibiting incivility.46 47 However, unlike facing a bully, dealing directly with the uncivil person may not be a good option. Incivility manifests as a rude or disrespectful action that is difficult to use to invoke adverse management actions at the organisational level. In our study, seeking help from a trusted person and organisation was the most common strategy used by nursing students. Using indirect confrontation coping strategies can elicit positive results for students, such as accommodating negative emotions, which is beneficial for building good interpersonal work relationships.23 24 48 Additionally, these strategies can protect victims in the hierarchical system.30 34 Therefore, hospitals or universities should have an immediate response person or system to help nursing students confronting incivility and to follow-up and monitor the development. We found that work overload and job stress were important factors contributing to incivility. This result is similar to those of previous studies showing that work overload may increase an employee’s tendency to display uncivil behaviours and provide them with no time for niceties.49 A significant relationship exists among workplace incivility, job stress and turnover intention.50 The consequences of overload and unmanaged stress are incivility. Stress stemming from incivility can also silently kill productivity of staff/students. The vicious cycle of ‘overload work-work stress-incivility’ should be broken. Self-monitoring is an important process during which medical staff should detect, reflect on and assess their own behaviour. In particular, preceptors need to know the emotional triggers and how to curb negative responses. Nurse leaders can provide stress-reducing interventions to lead the organisational cultural to develop a more open communication environment and have less incidences of workplace incivility. Another issue needs to be considered when interpreting our findings. The levels of confidence across six synthesised findings were downgraded due to dependability issues and a mix of unequivocal and credible findings. Among the 18 included studies, the majority did not report the authors’ influences (eg, roles, beliefs and value) on the studies, which influenced the dependability of all synthesised findings. We recommend that future studies strengthen the methodological quality of qualitative studies and add credibility to the research findings. The strength of this study is that we performed a comprehensive search strategy to find all relevant studies in nine academic and four grey literature databases. Both journal articles and theses were included to provide unbiased results. Another strength is that we used the JBI meta-aggregation method to synthesise qualitative data, which avoided re-interpretation of the original studies. Finally, to the best of our knowledge, no qualitative systematic review has examined this topic. Our study also has limitations. First, similar to all meta-syntheses, the findings are limited by the study quality and the interpretations of the original researchers. Additionally, we only included studies in English. All included studies were conducted in USA, European countries and Australia. Cultural variation may have resulted in variation in individual responses to incivility. Therefore, the findings can only be generalised to other contexts with a similar culture. This study synthesised qualitative evidence on the experiences and perceptions of incivility during clinical education of nursing students and evaluated the influence of incivility on student nurses. The findings showed that the experience of incivility in clinical education was common and had negative impacts on nursing students and the nursing profession. We suggest that nursing students should try to cope with incivility positively. Nurse managers and clinical preceptors should be aware of the prevalence and impact of incivility and implement policies and strategies to reduce incivility towards nursing students. Hospitals and universities should have an immediate response person or system to help nursing students confronting incivility and create an open communication environment. The authors thank the visiting scholars in the NYU Rory Meyers College of Nursing for their invaluable comments on this paper.
. Incivility in nursing education: a descriptive study of definitions and prevalence. J Nurs Educ 2007;46:7.
. Dental students' and faculty members' perceptions of incivility in the classroom. J Dent Educ 2009;73:119–26.
. Lost in a crowd: Anonymity and incivility in the accounting classroom. The Accounting Educators' Journal 2010;20.
. Student nurse experiences with staff nurse incivility in clinical settings: University of Alaska Anchorage, 2012.
. Behaviors that undermine a culture of safety. Sentinel Event Alert 2008;9:40.
. Chapter 2: Systematic reviews of qualitative evidence. In: Aromataris E , Munn Z , eds. Joanna Briggs Institute Reviewer’s Manual: The Joanna Briggs Institute, 2017. https://reviewersmanual.joannabriggs.org/. Joanna Briggs Institute. 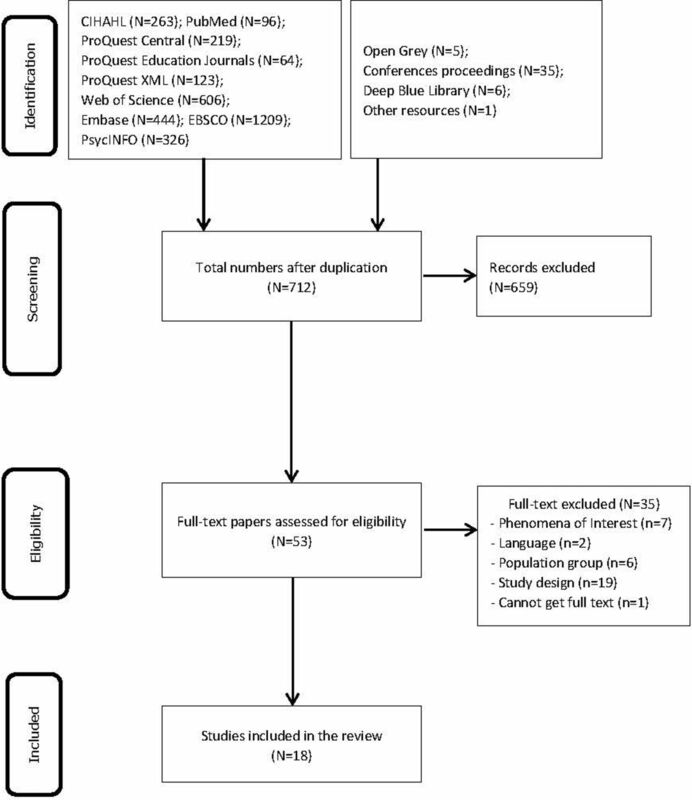 Summary of findings tables for Joanna Briggs Institute Systematic Reviews [Internet]. 2016 http://joannabriggs.org/assets/docs/sumari/Summary_of_Findings_Tables_ for_Joanna_Briggs Institute_Systematic_Reviews-V3.pdf.
. Vertical violence and the student nurse: Is this toxic for professional identity development? University of Southern Mississippi, 2012.
. Student voices on faculty incivility in nursing education.
. I was yelled at, intimidated and treated unfairly”: Nursing students’ experiences of being bullied in clinical and academic settings, 2017.
. Verbal abuse of nursing and midwifery students in clinical settings in Turkey. J Nurs Educ 2006;45:396–403.
. Bachelor’s degree nursing students' lived experiences of nursing staff’s incivility: A phenomenological study: Capella University, 2015.
. Nursing student encounters with incivility during education in a clinical setting: Capella University, 2015.
. 10. Making large-scale, sustainable change: experiences with the KiVa anti-bullying pro-gramme Ending the torment: tackling bullying from the schoolyard to cyberspace . 2016;75.
. Managing student incivility and misconduct in the learning environment. Teaching in Nursing-E-Book: A Guide for Faculty 2015;230. Contributors Study design: WX; data collection and appraisal; data analysis: manuscript writing: ZZ, WX; study supervision: YH; critical revisions for important intellectual content: LL, YH, MG. All authors revised and accepted the final draft. Funding This work was supported by the Fudan Nursing Foundation (FNF201520).